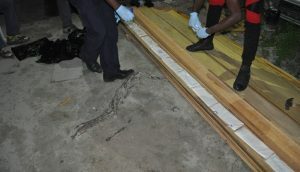 As the probe continues into the GYD$550 million worth of cocaine-in-dressed lumber, Guyana is seeking international assistance to recover recordings that may have been erased from a digital recording device, the Customs Anti-Narcotics Unit (CANU) said Tuesday. “CANU still has a Digital Video Recording device retrieved from Nazim Gafoor at Vreed-en-Hoop, West Bank Demerara that has been discovered to have been ‘wiped’ and as such CANU is now seeking international assistance in retrieving the data that may have been therein,” the agency said in a statement. Nazim Gafoor, a motor racer, his father, Tazim, and several porters have been questioned and released from custody. CANU also confirmed that motor racer, Stephen Vieria, has been released from custody at the end of his 72-hour detention period but his girlfriend was been arrested, questioned and released. Saw-miller, Narine Lall, has not yet been contacted or questioned. CANU alleges that Vieria is recorded on the shipping documents as Lall’s representative. Meanwhile, CANU, which comes under the umbrella of the Ministry of Public Security, appealed for patience as investigators work to ensure the the anti-drug agency does not lose the expected court case. “It would be expedient to charge persons only after we have enough evidence to link the parties and the contraband all with a view to ensuring a successful prosecution rather than to rush and come up short in the courts,” the agency said. Although no one has been charged, authorities claimed success in the drugs bust that was made at Zeelugt, West Coast Demerara on May 12, 2017 in front of the premises of one Hakim Mohammed. “At this time CANU still considers this narcotic exercise to a great extent successful since the Unit was able to expose and as well put a dent in pockets of the financiers of this clandestine operation,” the agency said.